Former FIFA president Sepp Blatter on Friday arrives at the Court of Arbitration for Sport in Lausanne for the appleal of Michel Platini against his six-year FIFA ban for ethics violations. FIFA’s disgraced former president Sepp Blatter arrived at the Court of Arbitration for Sport (CAS) on Friday to testify at Michel Platini’s appeal against his six-year ban from football over ethics violations. 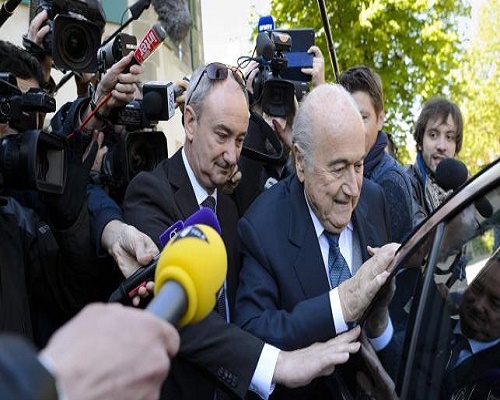 “I was asked to be a witness today in the case concerning Mr. Platini and I accepted,” Blatter told reporters as exited his car outside the court in Lausanne, Switzerland. Blatter is a key figure in the saga that saw Platini, the suspended head of European governing body UEFA, ousted from football. In December, FIFA judges banned both men for eight years over a now infamous 2 million Swiss franc ($2 million, 1.8 million euros) payment that Blatter sent to Platini in 2011. Blatter and Platini have claimed the funds were part of a legitimate oral contract in connection with consulting work that Platini did for FIFA between 1999 and 2002. FIFA’s judges deemed that explanation unconvincing, but an appeals body at world football’s governing body reduced their bans to six years in February, citing mitigating circumstances. Platini’s appeal at CAS, the world’s top body for disputes in sport, marks his final chance to overturn his suspension. UEFA has said it will not replace Platini until all his appeals have been exhausted. If successful at CAS, Platini could immediately reclaim his UEFA post and preside over the Euro 2016 tournament which opens in June and is being hosted in his native France. UEFA vice president Angel Maria Villar, who will testify on Platini’s behalf, also entered the courthouse, without speaking to journalists. The head of the Euro 2016 organising committee, Jacques Lambert, was also on hand to support Platini’s case.